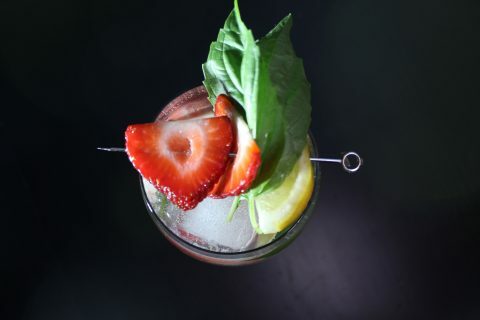 In my never-ending quest to create the perfect home bar I jump on anything that gives my set-up unique character and fits my personal style. 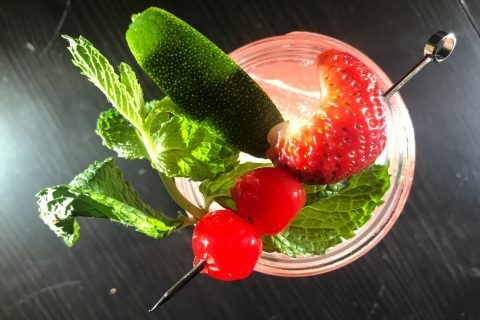 I have already reviewed a couple of pint and rocks glasses on here but I have yet to find a shot glass that is engaging and striking yet not gaudy or chintzy, until now. 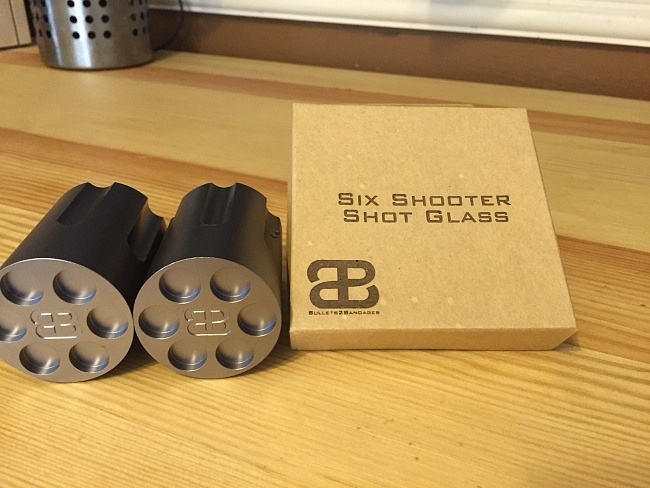 Enter the Six Shooter Shot Glass by Bullets to Bandages, an engaging and masculine shot glass that is not too over the top nor too plain. 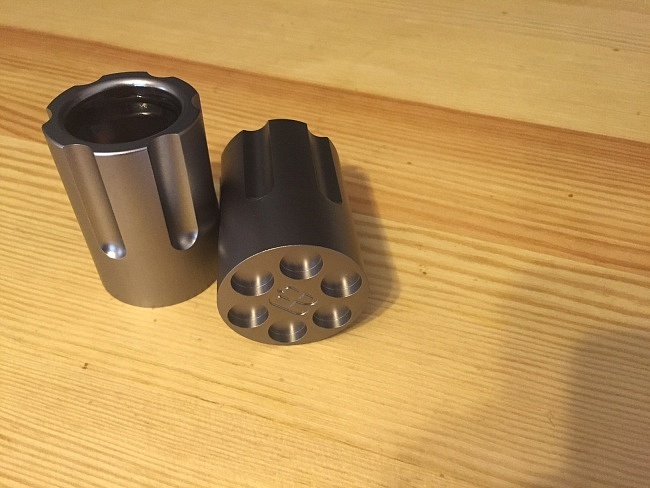 The Six Shooter Shot Glass is modeled after the cylinder of the iconic Colt revolver and holds a standard liquid shot of 1.25 oz. On the bar these glasses are unobtrusive yet beckon to be inspected closer. The grooves on the side mimic those on the colt making them easy to hold and drink from while the anodized aluminum gunmetal finish sticks true to its revolver styling, even making smudges and fingerprints nearly invisible. The bottom of the glasses are finished with bullet chamber inlays and Bullets to Bandages’ very slick emblem. Each order comes with a pair shot glasses, a gift box and optional engraving. The most impressive aspect of these shot glasses however comes from the Bullets to Bandages brand itself, a company built around raising awareness of veteran’s issues and giving a portion of its profits every year to veteran related charities. 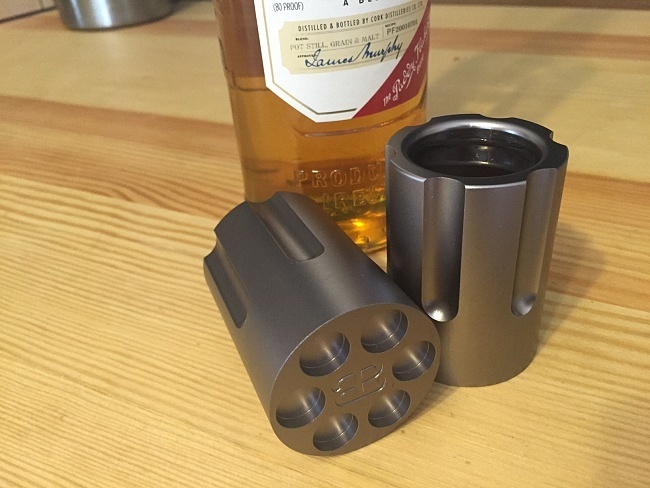 Bullets to Bandages was founded by two veteran Naval Explosive Ordnance Disposal officers in 2011 in order “to take instruments of war and transform them into symbols of pride, gratitude, and healing.” Bullets to Bandages is a mission-focused brand that I am proud to represent on my bar via these incredibly stylish shot glasses. 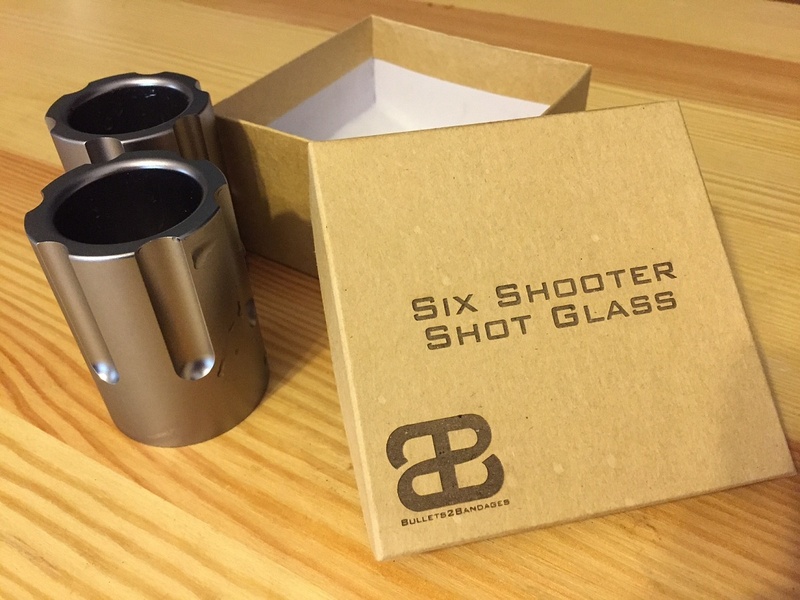 Do yourself a favor and pick up a pair of Six Shooter Shot Glass by Bullets to Bandages and load up a couple of shots of your favorite liquor.